Let us know what your trees, shrubs, and bushes need to look their best. If you aren’t sure, we’re happy to come out to your location and give you our professional, no-pressure assessment of your landscaping needs as well as a free quote on the work. Also, if you have any questions, feel free to give us a call, or you can check out our FAQ page! Along the Front Range, the most desirable trees in landscape applications have been purchased, planted and well cared for in order to thrive in our climate. With so much already invested in our landscape trees, it only makes sense to do everything we can to ensure their health and longevity. Proper pruning of trees promotes good structure, so damage from storms or complete tree death is less likely to occur. Pruning can improve aesthetics, which has an impact on the the value of your property. 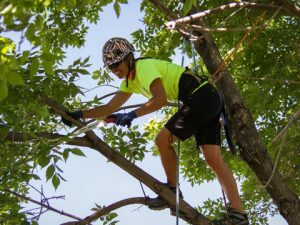 Pruning removes unwanted branches from trees, mitigating potential hazards & allowing light and air to penetrate the entire canopy. As Arborists, we hold ourselves to a high standard. Excessive or improper pruning can cause detrimental harm to trees that can have an affect for years to come. Proper pruning has a positive compounding affect that adds years to the life of trees and shrubs. We think carefully about each cut we make, ensuring that no branch is removed without good reason. Arboriculture is both an art and a science, and we work to maintain that balance on every job that we do in order to make our customers happy! Lumber Jack & Jill Tree Service is glad to attend to the ornamental shrubs & bushes in your landscape as well. Protect your investment, build equity in your property and keep your yard safe with one phone call to the Lumber Jack & Jill team!